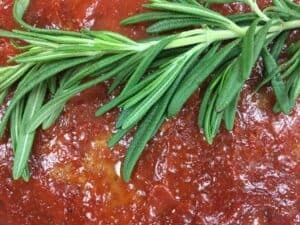 Juicy meatloaf with a delicate hint of hickory smoked flavor topped with a thick, tangy tomato-based sauce. An easy classic meatloaf recipe made with ground beef and a blend of the perfect seasonings. Quick note: This post contains a few affiliate links. Please read my disclosure statement for more details. 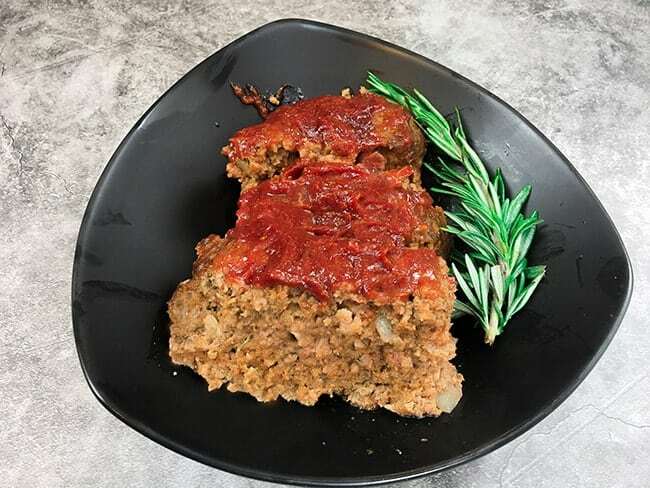 If you’re looking for that perfect meatloaf recipe, then you found the right place! This turned out to be the best meatloaf that I’ve ever made. The reason this meatloaf recipe is so special is because of a special ingredient that I discovered on a whim. I’ll tell you about it in just a bit. 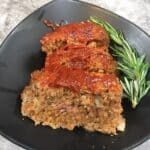 But this meatloaf is also special because I use a slightly different method when it comes to blending the meatloaf before baking (that makes it more juicy and tender). Don’t worry, it’s a super easy recipe! The best meatloaf starts out with fresh hamburger meat, preferably ground chuck. First, you’ll mix the wet ingredients with the seasonings in a large bowl. Then, you’ll add the ground beef, bread crumbs, and onions. Mix it with your hands as if you’re kneading dough. Which means, you’ll gently fold the outside of the meat mixture inwards and press down with the heels of your hands. You’ll only repeat this process about 6-8 times or until the ingredients are just blended. The reason you don’t want to over mix the meat mixture is because if you do, the meatloaf will become too dense and you may end up with a tough meatloaf. Don’t stress about the kneading process because as long as you gently mix all the ingredient together, the meatloaf will still turn out perfectly fine. Shape the meatloaf into a rectangular shape and place in a baking pan. No need to use a meatloaf pan! But you do want to use a rimmed pan to keep the juices from flowing over and onto the bottom of your oven! A 9 x 13-inch cake pan works well as you will shape the meatloaf approximately 5 x 10 inches in size. No need to bring out the ruler to measure! I like this 9 x 13 pan by Nordic Ware. After you’ve shaped the meatloaf, place it in the pan. Mix the ketchup, tomato paste, and smoked paprika then spread on top of the meatloaf. Bake at 325, uncovered, for about 1 to 1.25 hours. Then, let it rest for 5 minutes before slicing. Letting it rest seals in the juices so try to be patient because it really makes a difference. Garnish with parsley or a sprig of rosemary, if desired. Delicious! Oh, about that special ingredient I told you about. A lot of great meatloaf recipes call for Worcestershire sauce. I was out of Worcestershire sauce the day I wanted to make a meatloaf so I used the Allegro instead. I already knew Allegro was a great marinade for chicken and steak; and I even add it to flavor green beans so I thought “Why Not Try It”. And now I know it adds a delicious flavor to meatloaf, too! This stuff is awesome and I highly recommend it! IF you have any of this meatloaf leftover, there are many ways to serve it the next day. One way is to serve it as a sandwich or in a bun. Meatloaf is particularly crazy good in a yeast roll (enter sister shuberts!). Serve it on top of spaghetti or use it as a topping on your favorite pizza crust! How do you serve leftover meatloaf? After baking, I like to add a little garnish such as a rosemary sprig or parsley. Garnish is optional of course. Saute chopped onion in small amount of olive oil until soft. Set aside. In a large bowl combine eggs, 3 oz tomato paste, Allegro, pepper, garlic powder, thyme, and smoked paprika. A whisk works well at thoroughly combining these ingredients. Add the ground beef, bread crumbs, and sauteed onions. Mix well but do not over mix. Suggestion: Use your hands, in a kneading fashion, to blend the beef with the egg mixture. Place the ground beef mixture onto a rimmed baking sheet or 9" x 13" cake pan. Shape the ground beef mixture into a loaf approximately 5" x 10". Mix the topping ingredients then spread on top of the meatloaf. Bake uncovered at 325 for about 1 hour to 1 hour, 15 minutes. Let rest 5 minutes before slicing. Note: You can typically find Allegro Hickory Smoke Marinade in most grocery stores. But if you can't find it, you can use Worcestershire sauce instead. If you try this recipe and like it, please let me know. I’d love to hear from you!! TRY SOME OF MY KITCHEN SERENITY’S OTHER RECIPES!